Fans flock to a Portland Sea Dogs home game in 2016. 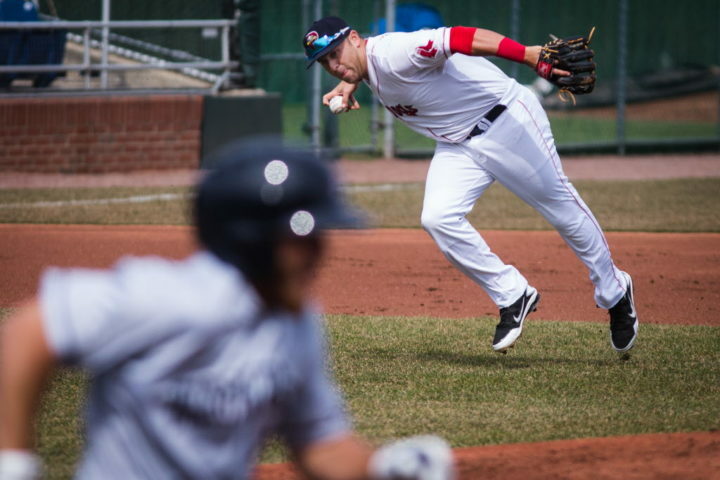 The Portland Sea Dogs baseball team is celebrating its 25th season in the city this year. Playing home games at Hadlock Field on Park Avenue, they’ve drawn over 9 million fans. When they opened in 1994, it had been 45 years since Portland’s last professional ballclub, the Pilots, folded in 1949. Here’s a look back at the last quarter century of Sea Dogs history. June: Dan Burke, wealthy President and CEO for Capital Cities/ABC, files an application with the Eastern League to establish a franchise in Portland. Burke is one of 13 applicants for the two new Double-A teams as a result of the National League’s expansion. July 7: The Portland City Council votes 8-1 to support looking into Burke’s effort to bring professional baseball to Portland. Local media reports Burke met with councilors at a largely private dinner meeting the week before. October 4: Portland and New Haven, Connecticut, are selected as the sites for the two new teams. The New Haven team would later fold in 2010. October 20: Burke hires Charlie Eshbach, President of the Eastern League, to be President and General Manager of the Portland franchise. Eshbach is still working for the team today. Portland Sea Dogs hall-of-famer, and former Red Sox first baseman, Kevin Youkilis poses for a photo with the Scarborough High School softball team at Hadlock Field in 2017. March 25: The Sea Dogs is chosen as the name of the new team. A local radio poll reveals 80 percent of listeners dislike the name. Among other suggested names were Breakers, Lights and White Caps. May 3: It’s announced that the team will be affiliated with the Florida Marlins. February 26: Fans camp out overnight in 12 degree temperatures to purchase tickets. April 18: The Sea Dogs play their first game in Portland. Kathie Lee Gifford sings the National Anthem. Frank Gifford throws out the first pitch. The Sea Dogs lose to the Albany-Colonie Yankees 7-6. May 7: Slugger the Sea Dog makes his first appearance at a game. September: The Sea Dogs win the Eastern League Northern Division and advance to the playoffs but are defeated by New Haven..
June 29: The Sea Dogs welcome the 1-millionth fan in franchise history. September 11: The Sea Dogs lose the deciding game of the Eastern League Championship Series at Hadlock Field to the Harrisburg Senators. 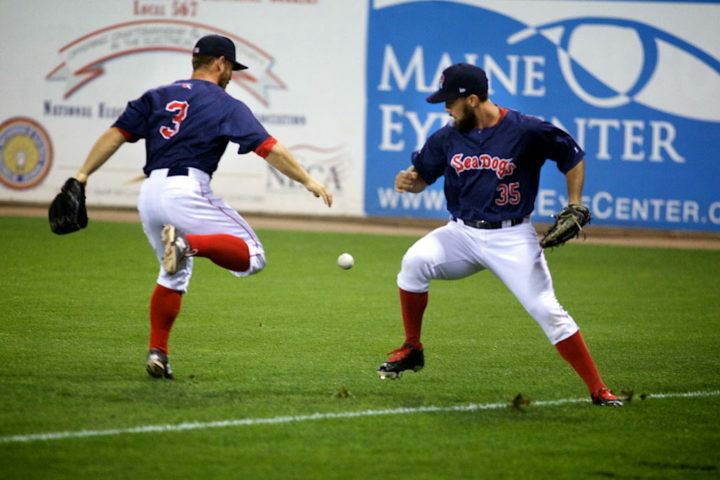 The ball drops between Sea Dogs Kevin Heller (right) and Sean Coyle during a game on Sept. 5, 2014 at Hadlock Field in Portland. August 15: Wearing 1926 Portland Eskimo replica flannel uniforms, the Sea Dogs emerge from a corn patch in center field in a “Field of Dreams” entrance. The recurring event becomes an annual fan favorite. September: The Sea Dogs win their third straight Northern Division title but once again lose to Harrisburg in the Eastern League Championship Series. September 6: The 2-millionth fan in franchise history is welcomed to Hadlock Field. June 29: The Sea Dogs host their major league affiliate, the Florida Marlins, in an exhibition game at Hadlock Field in front of 6,910 fans, the largest crowd in franchise history at the time. The Sea Dogs defeat the Marlins 9-2. 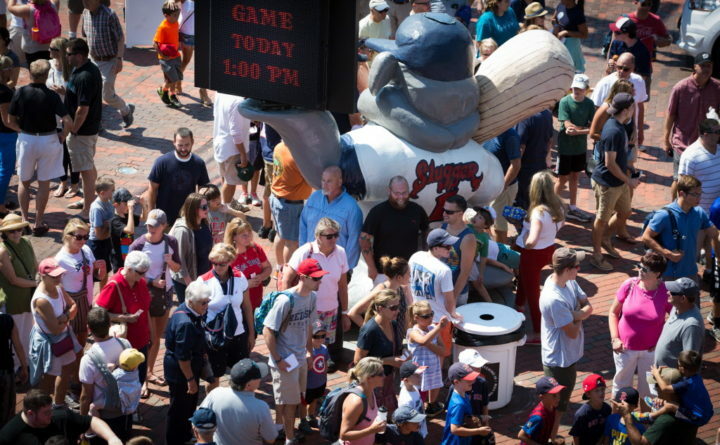 July 25: The Sea Dogs’ 3-millionth fan in franchise history comes to to Hadlock Field. Portland Sea Dogs third baseman Mike Olt scoops up a grounder and fires to first in an extra inning at Hadlock Field on in 2017. September 18: The Sea Dogs begin a new affiliation with the Boston Red Sox. All of the skyboxes at Hadlock Field are renamed in honor of Red Sox greats. October 28: Construction begins on a likeness of Fenway Park’s Green Monster in left field. April 10: After the entire first week of the season is postponed by snow, the Sea Dogs play their first home opener as a Red Sox affiliate. They lose 4-1 to the Trenton Thunder, the new affiliate of the New York Yankees. April 30: The Sea Dogs welcome the 4-millionth fan in franchise history. September: The Sea Dogs break their all-time franchise attendance record as 434,684 fans come to Hadlock in 2004. September 1: The Sea Dogs win the Eastern League Northern Division and qualify for the playoffs for the first time in eight years. Portland then advances to the Eastern League Championship Series. Akron defeats the Sea Dogs, three games to one, in the championship. October 3: The Sea Dogs announce plans to expand Hadlock Field by 390 seats. July 3: The Sea Dogs welcome their 5-millionth fan in franchise history. September: Due to expanded seating, the Sea Dogs set another attendance record, averaging a franchise record 6,358 fans per game. September 17: The Sea Dogs capture their first Eastern League Championship, defeating the Akron Aeros three games to two. It is the state of Maine’s first professional baseball championship in 91 years. April 5: A foot of snow falls on Hadlock Field forcing the postponement of the Sea Dogs home opener against the Connecticut Defenders. June 18: The city of Portland grants the Sea Dogs a 20-year lease extension on Hadlock Field. September 1: Clay Buchholz, who spent most of the season with the Sea Dogs, throws a no-hitter for the Boston Red Sox against the Baltimore Orioles at Fenway Park. Buchholz is the first Red Sox rookie to throw a no-hitter. September 4: The Sea Dogs clinch their third straight playoff appearance, defeating the New Hampshire Fisher Cats in a one-game playoff at Hadlock Field. Mookie Betts, then a top prospect for the Boston Red Sox and Portland Sea Dogs second baseman, puts his glove down for a ball during batting practice at Hadlock Field in April 2014.
pitches two scoreless innings to earn the win. Johnson is the first position player in Minor League Baseball history to deliver the game winning hit and be the winning pitcher. August 25: Clay Buchholz makes his first start with the Sea Dogs after being sent down from Boston. It happens to be Clay Buchholz bobblehead doll night in commemoration his 2007 no-hitter against Baltimore. August 28: The Sea Dogs welcome the 6-millionth fan in franchise history. August 31: The Sea Dogs clinch their fourth straight playoff berth, the longest streak in team history. July 1: The Sea Dogs welcome the 7-millionth fan in franchise history. October 26: Sea Dogs Founder and Owner Dan Burke dies. April 21: The Sea Dogs turn their first triple-play in franchise history. May 28: Jane Charron, of Falmouth, enters the ballpark as the 8-millionth fan in franchise history. August 30: The Sea Dogs earn their 87th win of the season, setting a new franchise record for a single season. The Sea Dogs end the season with an 88-54 record. 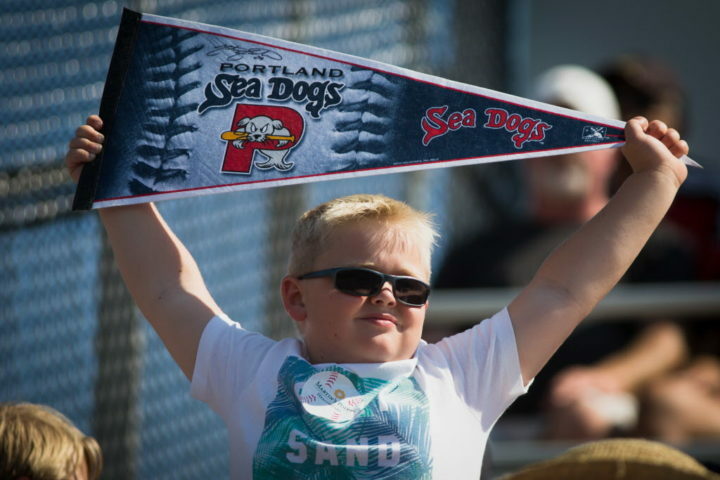 Griffin Boulier, 7, of New Gloucester waves his Sea Dogs pennant at the team's final home game of the season in Portland in August 2016. August 25: Mike Davis, of Falmouth, enters the ballpark as the 9-millionth fan in franchise history. January 13: The Red Sox extend their contract with the Sea Dogs through 2020. April 12: The Sea Dogs announce they will begin selling Moxie at all their concessions.